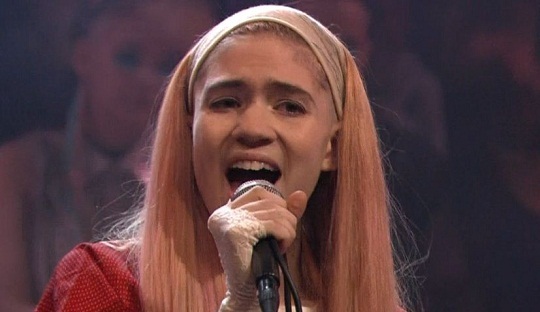 "The appearance serves as another triumph for one of the most exciting new artists in recent memory and one that continues Grimes rapid ascent into the popular consciousness..."
Grimes made her US television debut on Jimmy Fallon last night, performing 'Genesis' from her 4AD debut Visions. The Canadian experimental pop starlet was armed with two incredible backing dancers and rocking the red kimono better than your dad ever did in the late 80's for a performance that serves as a pleasant reminder of what all the fuss has always been about for the producer. The appearance serves as another triumph for one of the most exciting new artists in recent memory and one that continues Grimes rapid ascent into the popular consciousness.